As a result of your load process, you send an email to your users to notify them that new data is available….right? Well you should. You can send a simple text email saying things are done, which certainly works, or, you can add some value and interest by providing some counts of what was loaded. (You are auditing your loads…. that is another topic) Your audit table already has everything you need, and a simple HTML table will get you professional looking output. Communication is a good thing! 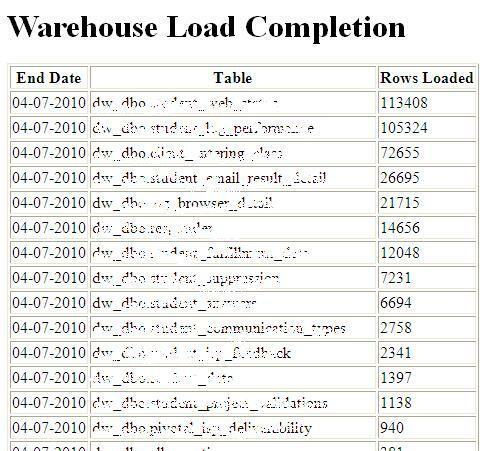 You should be letting your users know when loads are complete, what kind of data has been loaded, and what to expect. Since SQL Server 2005/2008 make the HTML tables so simple, there is no reason that those notifications should look “simple”. I know this is not what my blog is about… but a poll seems like the thing to do for today’s topic. Really neat way of sending out events/alerts in e-mail.